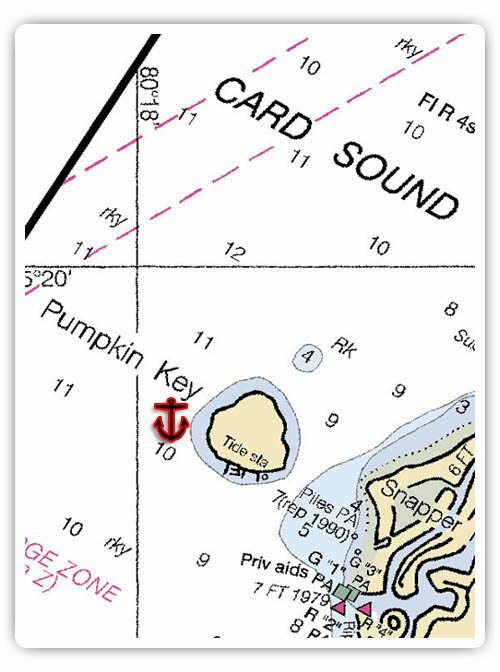 Pumpkin Key is one of the best anchorages for an exit from Bayside to the Gulfstream. Even at low tide if you draw 5ft or less you’ll have no problem. Deeper draft boats will have to wait for high tide. The anchorage is not where it is shown on the chart, but to the SW of R12 between Pumpkin Key and the marker in 8-12 feet of water. Good holding and protection and even if it blows from the West, you’ll be OK. However, if you’re expecting bad weather, you can go NW of the anchorage across the bay to the Arsenicker Keys and anchor in 8 feet of good holding sand with beautiful clear water and excellent protection from the West. The oddity is that the water at Pumpkin is opaque green while the Arsenickers is Bahamas like.